The exhibition traveled all over West Virginia this summer: Grantsville, Morgantown, Jackson's Mill, Parkersburg, and Elizabeth. The exhibit will be part of History Day at the State Capital Building in Charleston in late January, and Burnsville and Weston in May and June. The exhibit will continue to travel through summer 2004 to locations such Hurricane, Point Pleasant, Lewisburg, and Huntington. 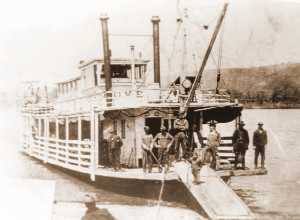 Gary with the Gainer, a boat that brought students to Glenville Normal School early in the century (left). Right: The countryside near Eden, West Virginia. The Dove and crew in Grantsville. 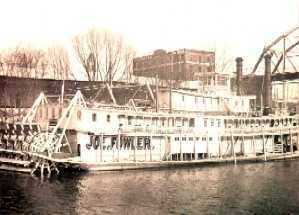 The Joe Fowler in Parkersburg. Tuesday, August 24, from 6 - 8 P.M.